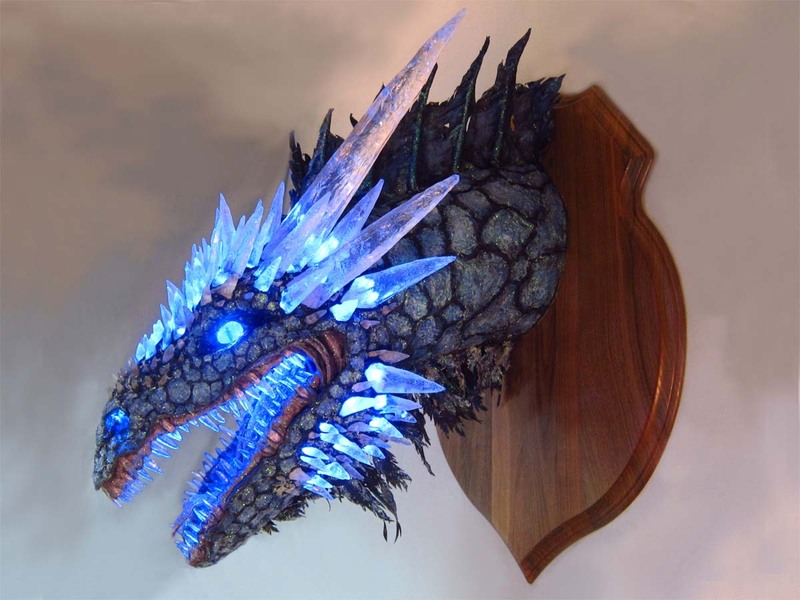 ← Paper Mache Ice Dragon – Finished! 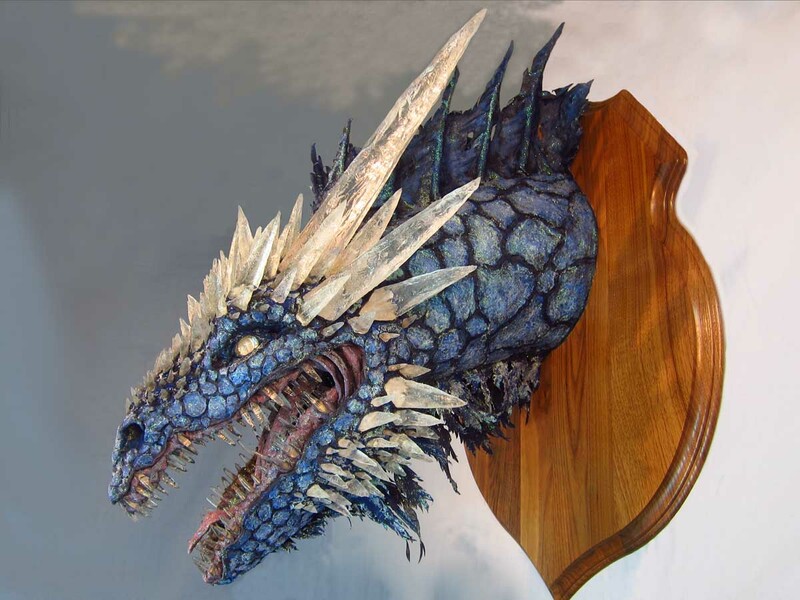 This entry was posted in Paper Mache Ice Dragon and tagged cloth mache, Daenerys, dragons, Game of Thrones, paper crafts, paper mache, paper mache instructions, paper mache recipes, papier mache. Bookmark the permalink. 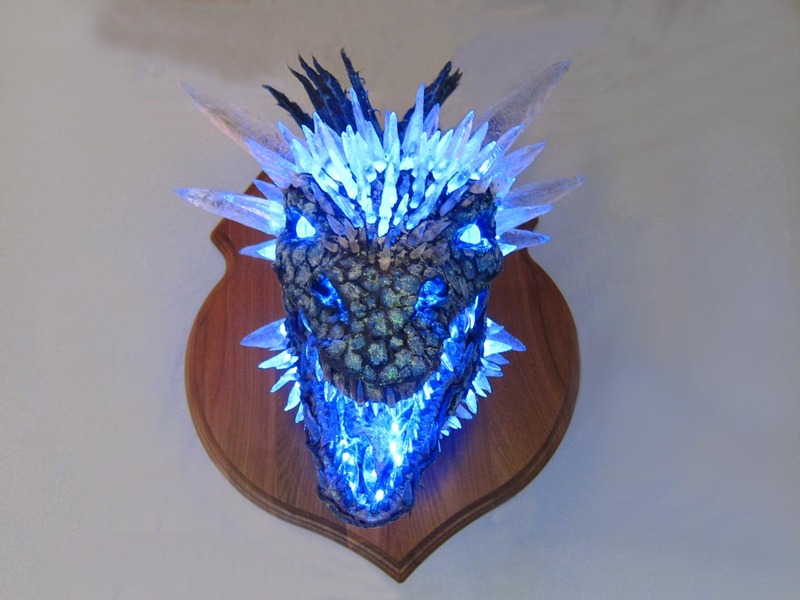 42 Responses to Paper Mache Ice Dragon – Finished! Wow! I would love to see your work in person some day.This is amazing! Hey Mona. So nice to hear from you, as always! Yes, this project really looks soooo much better in person. It is just so much more subtle in the colors and the lights. But overall I’m pretty happy with how much the photos captured. Hope all is well with you and your art, and your kitty of course!. Astonishing!! The teeth and horns especially are breathtaking. I can’t imagine how gorgeous it must be in person. ps: you gotta be kidding about people coming and pointing flaws to you, right? Hey Nacho. Yes, Have to say, it really does look a lot better in person. There is so much more subtlety in the color and the way the lights reflect off of the glitter. Thank you as always for your comments! PS. I truly “get” how life can get in the way of art! It really helps to be retired! Don’t worry, you’ll get back into it. And I wasn’t kidding about the flaws. This is from experience! Your posts have absolutely fascinated me. Your working methods are brilliant. The care you take to make each project is amazing. I have enjoyed every minute of these posts. Keep posting. Fabulous — as usual! No one can make a dragon as well as you! NOBODY! Well Sue, you are always the best. Thank you as always for your support and encouragement. The thing is, I enjoy the detail. I get lost in doing labor intensive projects. I think that is why they turn out well. Hope all is well. Flaws? That’s pretty funny. 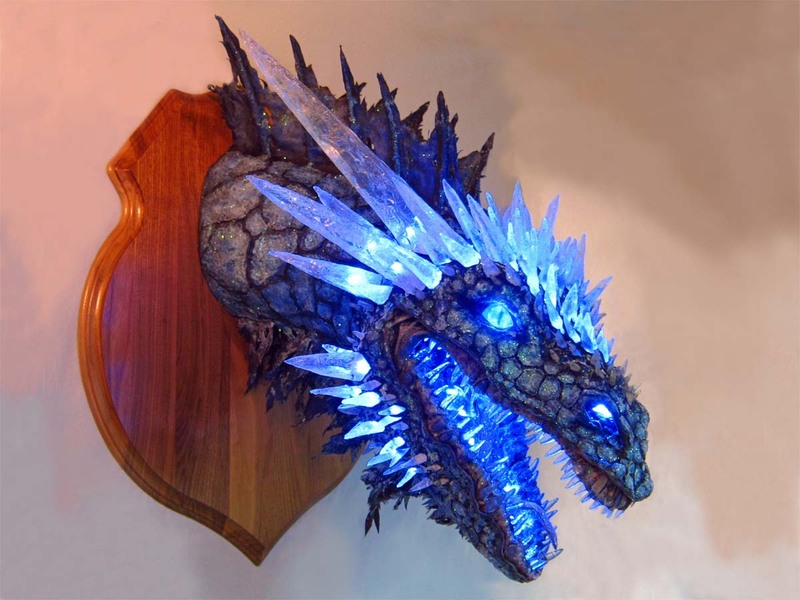 This is a gorgeous ice dragon!! I love the lights behind the ice spikes – blue was a great choice. It makes the dragon look colder. And it also looks good with the lights off, for his daytime look. Wow! Flaws? Are you kidding me. It looks great! I wanted to tell of a similar situation that I have run to over the years. I build aerobatic radial engine biplanes. When people come up to me and point out what they consider are flaws I ask them how many airplanes have you built? If yes, do you fly the planes you build in air shows? It usually stops them dead! Love this Ice Dragon! I love all of the things Dan builds! Impressive as usual. Thanks for the support Steve! I couldn’t imagine flying in something I built! That is obviously a whole new level of expertise! Looks magnificent Dan and I bet it looks even better in subdued lighting – Well Done. Thanks David! Yes, indeed it does. In person you can see much more detail with the glitter and the lights looks great in lesser room light. Just can’t capture it the way I want, although overall I’m pleased with how the photos came out. Bravo! You have outdone yourself and exceeded even my expectations. This is magnificent! Thank you Pamela! Glad you like this one. I wasn’t sure about the placement of the lights at first. But I think they worked well in the end. This is absolutely gorgeous. Such incredible work. I see no flaws. It looks perfect to me. Well I won’t point out the flaws then! Thanks again! I was looking at your blog and saw your sea dragon. You have a beautiful Abyssinian. I have a red Abyssinian named Meatball. Your bengal is gorgeous as well. Hello Candy. I’m very sorry to say buy my two Abbys and our sweet Bengal have all died. They all had great lives and died peacefully. We got all three because they were “rejects”. They each had flaws that made the owners think they were lesser. Riley had an extra toe. Eddie was the wrong coloring and Max was a marble, the owner wanted the more chic spotted variety. So silly. They had the greatest personalities and were so sweet. The Abyssinian in particular have such great personalities I think. You are so lucky to have one! We have two cats now Abby and Maisie who we adore. Thanks for the nice note! I am so sorry but thankful you gave them very fulfilling lives. Our Aby was rejected as a show cat from his breeder. I didn’t ask why he was rejected because to me, he is absolutely perfect. He fits so well in my family. He is my first Aby and he has chosen me as his person. Such a beautiful feeling when they choose you. Really like him Dan, and I think he looks great without the lights too, fantastic colour. Thanks again for sharing your techniques with us. Lesley from Australia. Glad you like this one Lesley! It actually looks a lot colder with the lights off. In person you see the sparkle a lot more. It looks frosty. And of course most of the time it will sit with lights off, so it had to look good without them. Stunning, both lit and unlit. Thanks so much for tutelage and sharing. Thank you Lorraine! I wasn’t sure about the lights at first. But I think they look okay with this project. SUPER GREAT JOB!!!!!!!!! WAY COOL!!!!!!!!!!! Thank you as always Kathy! This project turned out amazing! Thanks for sharing your process, your talents and your cats with all your posts! It’s been fun watching how this one evolved. You are very welcome Claire! I’m happy that you found the process posts interesting. I wasn’t how they would be received. As per usual Dan, you have created another fabulous dragon!! Thanks so much for sharing all of your dragons and your amazing talent with us. Flaws? I don’t think so! That’s nice of you to say Tim! Thanks for the support! Hello Sir,I am from Nepal. love your PAPER MACHED Dragons very much. I also like to try these dragons. Could you please tell me what kind of materials do I need. ?please help me sir.